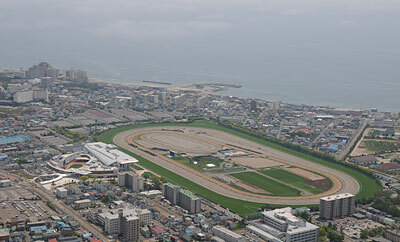 Situated in Hakodate City in Hokkaido, Hakodate racecourse has two race meetings each year. (Each race meeting usually has six to twelve days.) The major races are the Hakodate Sprint Stakes (G3), the Hakodate Kinen (G3) and the Hakodate Nisai Stakes (G3). The refurbishment of the grandstand was completed in June 2010. Approx. 20 minutes by bus from JR Hakodate Station. Approx. 25 minutes by Municipal Railroad (Tram) from JR Hakodate Station. A special bus (fare charged) from the Racecourse Main Gate runs while races are held. 10 minutes by car from Hakodate Airport.